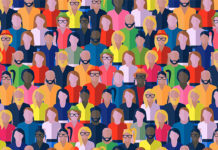 There are several companies competing to be the leader in measuring influence, and many agencies and brands trying to figure out how useful those metrics are, and how to best incorporate them into their targeting and their campaigns. But what if, instead of measuring the influence of strangers and then trying to convert them into fans, you could do something that might be even more effective: get people who are already fans, and give them the tools to become more influential. So far, Fanrank appears to be very popular with musicians and other entertainment brands, but there is no reason it couldn’t be used by any brand that has passionate fans. According to the information I picked up from Jamie Turner, the company’s VP of Product, at the October 12 Social Media Marketing & Monitoring Conference in New York, the app has been installed on over 6,000 Facebook pages and currently reaches over 130 million fans. Brands already using the app include Hotels.com, Disneyland France, the movie Drive, actors, athletes and musicians (Nicki Minaj, Nirvana, blink-182, Swedish House Mafia, and more). Oh, and here’s the Fanrank page for The Realtime Report. 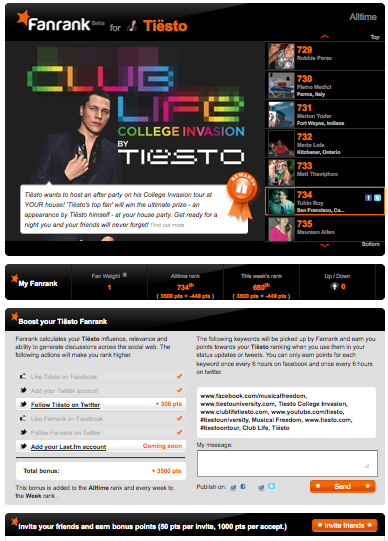 Dance music producer Tiësto has more than 8,000 fans competing for rewards such as a Tiësto-hosted party at their house, or VIP tickets for his performances. 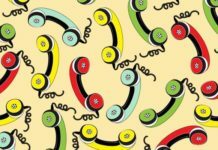 Musician David Guetta ran a 24-hour Fanrank contest to celebrate the release of his new album, offering Sony Ericsson phones to his top 5 fans–3,000 fans signed up to compete and help spread the word. The singer and actress Ximena Sariñana offered “goodies and a private video chat with the artist” to her #1 fan in the month of August– her Fanrank scoreboard now boasts 1500 fans. There are a couple of key ways in which the app is different from other reward applications. One is that it incorporates something called FanWeight, which attempts to measure the fan’s influence relative to the page. As of today, my score as a fan of The Realtime Report on Facebook is only 7 out of 100. That kind of hurt my feelings, but apparently my score will go up the more I talk about #RLTM and get re-tweeted. The points I earn by tweeting about the page of which I’m a fan are multiplied by my FanWeight, so the more active fans will see their points increase faster. The app limits the spam factor by limiting the number of times fans can earn points to once every 6 hours on both Facebook and Twitter. Once you’ve downloaded the app, you can install it on pages you administer, customize your page’s Fanrank page, assign keywords, rewards and shout-outs for your top fans. There’s also a stats page that shows the total reach of your fans, the number of posts and tweets they’ve generated, along with demographics and other fan data. 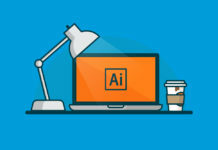 To be more successful, the company recommends that brands clearly state when a contest will end and winners will be announced, set up prizes that reward a larger number of fans, and post frequent updates about the contest. You can join our Fanrank page to play with the app–and let us know what you think. How would you use an app like Fanrank to help your fans become more influential around your brand? 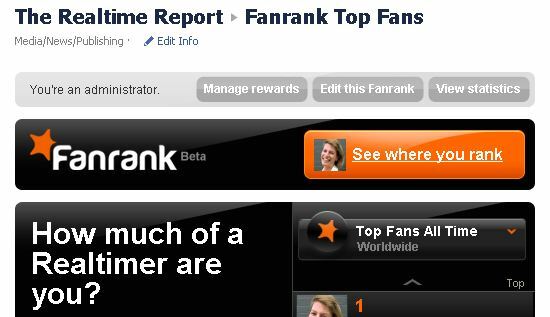 UPDATE 11/29: Fanrank recently announced that it had rebranded itself. It is now called Fanzy. @JoannDube Hi Joann – once I installed the app on your facebook, it did let me post on Facebook – but you may want to check with their support if you keep having trouble. Good luck & let us know how it works out. @JessPalotasfanrank that’s a really good point & great suggestion, I think. @Rvaya good luck & let us know how it goes! @tonia_riesfanrank Thank you! I emailed FanRank and here is what we came up with !! !